15th-century brown calf with blind stamp, brass corner pieces and centerpieces, hooks but missing clasps, rebacked; in brown cloth slip case. 286 leaves (1 column, 23 lines), bound : vellum, ill. ; 93 x 60 mm. Harry A. Levinson, Beverly Hills, CA; purchased by Julia Parker Wightman from Levinson in 1945; JPW 2024; Julia Parker Wightman Bequest in 1994. Ms. diurnal, calendar for Liège and Utrecht; written and illuminated in the Netherlands, ca. 1475-1490. Decoration: 4 historiated initials, 2 historiated borders, 3 large and elaborately decorated, numerous smaller illuminated initials; glued to end pastedown is a woodcut depicting Christ standing in a font holding a T cross, with cape and halo, a scroll above his head reading Fons Vitae, hand colored in ochre, pink, and brown. Texts: Prayers to 4 Church fathers - fol. 1v; Calendar - fols. 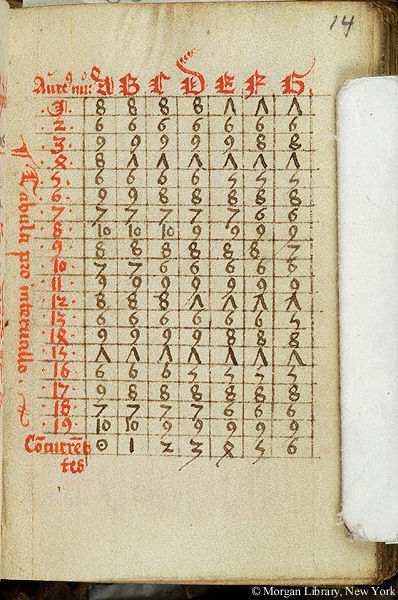 2-13v; Golden numbers - 14-15; Circular tables - 15v-16; thereafter the diurnal , fols. 17- 286v.